The Town Hall has been licensed by East Riding of Yorkshire Council as a venue for the Solemnization of civil marriages and the formation of civil partnerships. The Town Hall has been approved by the authority as a venue for marriage in pursuance of section 26(1) (bb) of the 1949 Act and the formation of civil partnerships under section 6(3A) (a) of the 2004 act. Your wedding day is one of the most important days of your lives, with that in mind every member of staff will assist in any way they can to make sure that we have done everything in our power to make your wedding day 'A perfect Day to Remember'. You can make an appointment to see Mrs Chris Berry or Mrs Nicky Thornton on 01964 532252 or call into the Town Hall to discuss your specific arrangements regarding your ceremony or reception. Below are various documents to assist you with booking your wedding. "We had our vintage themed wedding there and it was an amazing day. If like my husband and I, you are going for a DIY wedding it is a great space with lots of scope for creative personalisation. For those with a small wedding budget I would recommend Hornsea Town Hall as a ceremony and reception venue. The staff were friendly and accommodating from the start and were really professional. We had friends and family from all walks of life telling us how fantastic the venue was and we could not have been happier with the service we were given". You can hire the Town Hall not only for weddings but for parties too. We have two very good sized halls that can cater for larger groups, whether its a children's party a 21st or a golden wedding anniversary, we could be the venue for you. We have a fully equipped kitchen which is included in the hire price and we have a stage too so if your wanting a band to perform or put on a performance yourself you are completely catered for. If you are interested in hiring the Town Hall please do not hesitate to contact us or pop in and discuss your requirements. Please find below hire prices and booking forms. The Town Hall is also available for general bookings ranging from meetings to fitness classes. We have three rooms available, the Jubilee Room which is located on the top floor is the smallest of our rooms available holding a maximum of 30 people. 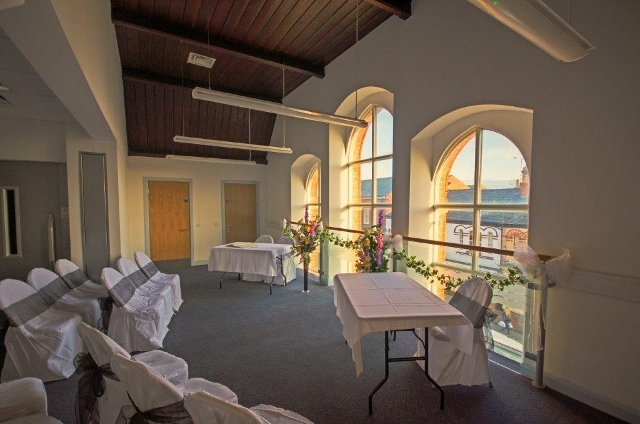 The Grovesnor Room is on the first floor and is the largest of the three holding a maximum of 110 people and then we have the Hall Garth Room on the ground floor which can hold a maximum of 120 people, the kitchen and toilets are also located on the ground floor. If you would like to speak to us about the hire of any of the these rooms then please do not hesitate to give us a call or pop into the Town Hall. Below are our room hire charges and relevant forms your will need to book the any of the rooms.